Eduardo Guillermo Bonvallet Godoy (January 13, 1955 – September 18, 2015), was a Chilean footballer. 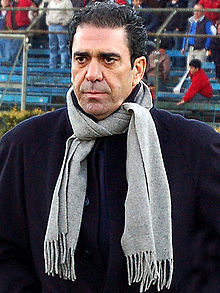 He played as a defensive midfielder and later developed a TV and radio sports commentator career. Bonvallet was found dead by hanging using a belt at Nogales Hotel in the kitchen of room 213. Local news report he was suffering from depression. ↑ El Gráfico Chile. "Murió el ex seleccionado chileno y comentarista Eduardo Bonvallet". elgraficochile.cl. ↑ El Gráfico Chile. "El parte policial sobre la muerte de Bonvallet habla de suicidio". elgraficochile.cl. This page was last changed on 23 January 2018, at 15:11.